Handle Addon for mtrain by amn30. Please visit here to download. openbve mtrain v2.5 is now available. Please go to DOWNLOAD page. Users are NOT allowed to copy the codes of the 3D mode and textures lto other trains. 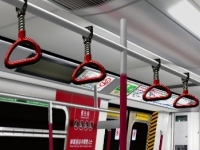 Users can change the texture of the train for their own interest. a new 3D cab is inserted to the mtrain.